wait, I can’t think of anything else. People around here love their Sharks, simple. Not a surprise, then, that the Sharks Fitness Faceoff, now in its 2nd year, was a big sell-out success. 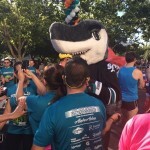 More than 2,600 people showed up at the SAP Center (home of the San Jose Sharks) on June 29 to participate in one of the five run or bike events held that day. 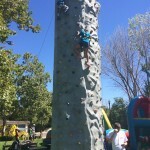 There was a 5K and a 10K for runners, a 20-mile or 50-mile ride for cyclists, and a fun kids’ run. I ran the 10K and KidRuns sprinted the kids’ run before going back to the expo area where there were a ton of fun things to do for kids and adults alike. 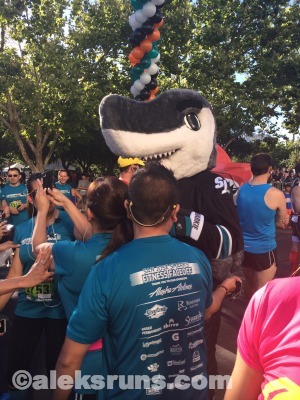 Both the 10K and 5K run courses weave through downtown San Jose: flat and fast. If your goal is to PR, the flatness and lack of distracting scenery – unless you find downtown San Jose beautifully scenic? – will definitely help! The 8 a.m. start wasn’t bad, either: not early enough to require a 5 a.m. wake-up call, but not too late to get scorched by the sun, either. I got dropped off near the SAP Center start area around 7:40, but later heard that parking was easy and free. Boom. I ran the first few hundred yards with those paper garlands wrapped all over me, by the way. Maybe that cost me a second or two? Since the race was only two weeks out of Ironman 70.3 Vineman (now only FOUR short days away, eeeek!!!!) and I had been hammering two- to three-hour training days for the past couple of weeks, running a fast 10K – or at least as fast a 10K as I could possibly run on fresh legs – wasn’t going to happen. Instead, I settled into a manageable 8-minute mile pace as early on as I could. That meant holding back a little in that first mile – you know how it is when you start a race, what with all the excitement and adrenaline, it’s easy to overdo it. About a mile in, Joe from our tri club caught up and that’s when the fun began! We run intervals at the track at about the same pace, so naturally, we fell into step and – with some talking but mostly grunting – ran the rest of the race together. It may not have been the fastest 10K I could possibly run on fresh legs, but it was still the fastest 10K I’ve run so far in my life (my previous PR was 49:58 from last year). A 7:56 min/ mile average, I’ll take it! After a quick post-run water + banana break and a change of clothes (found a clean porta-potty, too: score! 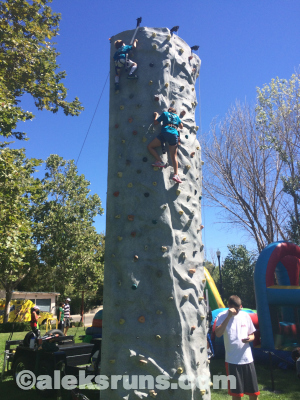 ), we all headed to the Post-Race Expo, which was chock-full of fun activities and giveaways. A Sharks Fan’s heaven! 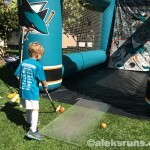 There was field hockey practice (is there a special name for this setup? Like a hockey batting cage? ): A rock climbing “wall” (little dude went up six times, getting a solid total-body workout in before his run): and several spin-wheels where we won Sharks-themed goodies (two plastic water cups, two key chains, a tumbler, a rubber hockey puck… all extremely necessary stuff that everyone needs to have in their house). By 10 a.m. the day was too hot already to be wearing a Sharks jersey, but no worries: the race shirts were Shark-y enough to make the fans happy! 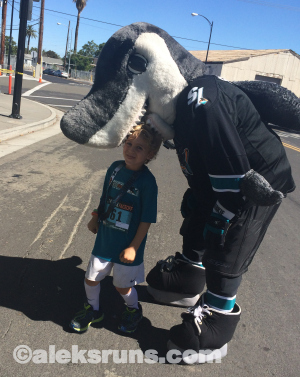 The Kids’ run was a short loop around the SAP Center. It couldn’t have been more than a third of a mile, but I swear I could barely keep up with the little dude! Also: running in flip flops = winning. Try it some time for a different experience! The only downside to having the kids run at 10 a.m. was that this was just about the time when cyclists were coming back in from their 50- or 20-mile rides and being out on the same course was a bit dangerous. But with an adult present to keep an eye on their kid(s), everything went smoothly. 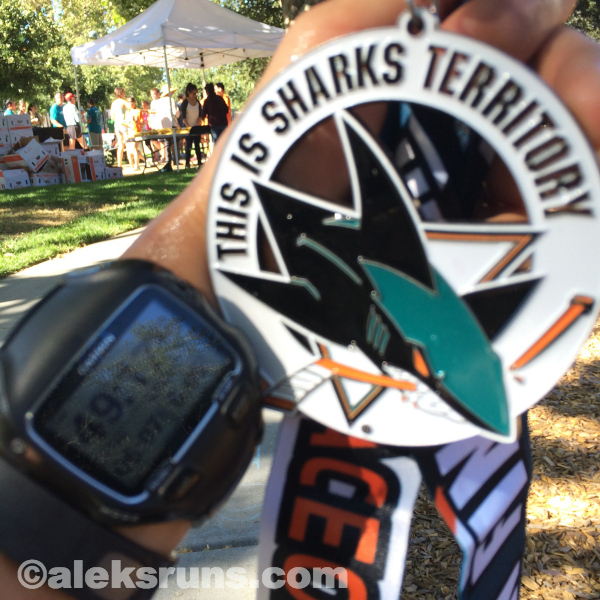 The kids got the same medals as the adults and, of course, photo ops with Sharkie: After all that, there was more Post-race Expo fun (a second, third and fourth rounds of hockey, more rock climbing, more Wheel of Fortune spinning). And just when all the kids must’ve been thinking that this day couldn’t get better, a man pushing an ice cream cart showed up. 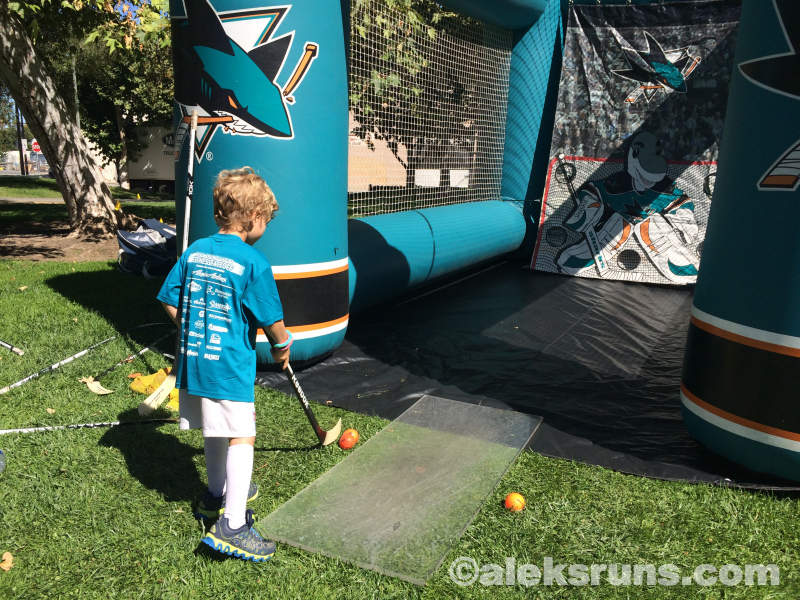 A day at the San Jose Sharks Fitness Face-off: fun. 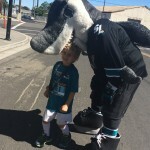 Double-handed high-five and a photo op with Sharkie: even better. An oversized three-flavor popsicle to top it all off? Priceless! I was waiting for this race recap. 😀 I like the shirts. I feel like this recap is a big doozy… but I can’t help it my brain is now 100% in Vineman mode 🙂 See you at the Y in a week or so!